We went on a short weekend trip to a resort in San Diego, and one of the things I tried was to use the the Giroptic iO to shoot a 360 video and a 360 live stream underwater. To use the Giroptic iO underwater, I used a waterproof pouch called the Dry-Pak DPC-69. It is 6 x 9 inches and can accommodate my iPhone 6 with the Giroptic iO attached. I’ve live streamed previously with the Giroptic iO and it had far better quality than this live stream, but that was because of my slow internet service at the resort. To make things worse, the water weakens the internet reception even further. Note that the stream also gets stuck at around 0:16. If your playback get stuck, you have to manually select 0:17 or a later part. Notwithstanding these hiccups, the live stream looked better than I expected (given the slow internet). The Giroptic iO is now available from Amazon (iOS version). 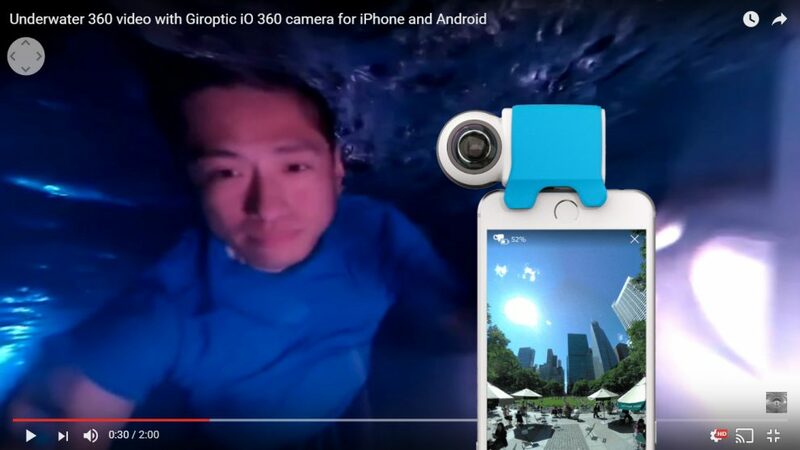 The Android version, in either Micro USB or USB Type C, is available from Giroptic’s website. NAB Show 2017: Gudsen Moza announces two new gimbals for 360 cameras!